In this acclaimed version of Edith Nesbit's evergreen story, The Railway Children are now young adults. As the play starts, Bobbie notices a toy train and suddenly memories are triggered. This glorious adaptation never runs out of steam as we meet Mr Perks and his family, the Old Gentleman and all the other well-known characters. 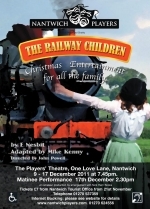 The Railway Children is perfect Christmas entertainment for the whole family.